At Independent Energy Consultants our clients have seen firsthand the savings that our competitive bids provide, and have seen the benefits of our Bill Auditing and Energy Accounting services. As a trusted energy manager we show our clients how to minimize the amount and cost of their electric and natural gas bills. With the advent of smart metering technology, real-time Energy Information Systems (EIS) are another service we provide that allows clients to monitor and control their energy consumption as it happens. Real-time energy monitoring works by attaching a wireless device to your existing interval meter. This device relays "data" from your meter to our energy monitoring servers, converts it to power intelligence and returns it back to you through web-based software 24 hours a day, 7 days a week. This allows you or a designated energy manager, like Independent Energy Consultants, to watch your consumption and suggest or take action when unusual patterns present themselves. By monitoring and adjusting electric usage, customers can influence their account's unique load profile. This is especially helpful to customers interested in shaving demand peaks to reduce costs and/or shifting electric consumption to lower-priced periods, if Time of Use (TOU) rates apply. The data quantity and quality can also help sourcing new supply contracts. By having detailed data, all the way down to 5-minute intervals, suppliers know precisely how you consume energy and are able to build in less risk premiums with their offers. A commercial facility with a building control system regularly sets its heating/cooling back at the end of the day. One night a shift runs late and they manually turn the heat up when things begin to cool down. Unknowingly the automated system has just been overridden and no longer makes the proper daily setbacks at closing time. As a result the facility begins using more energy than necessary when no one is in the building. 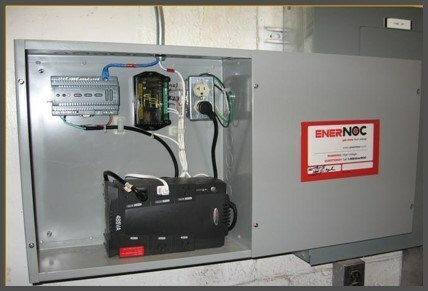 The issue, however, is easily and quickly diagnosed with a real-time energy monitoring system. Without it, the problem would likely go unnoticed and the monthly bills would climb. A manufacturing plant notices its electric usage creeping up while weather conditions, hours of operations and production output remain the same. Maintenance crews are then dispatched to inspect equipment and discover motor bearings are beginning to fail on one of the machines. The excess friction and heat is causing the large motor to consume considerably more electricity than normal. They are able to easily repair the machine and prevent a catastrophic failure. The facility is no longer using excess electricity and has avoided a costly and prolonged outage. These are common examples of "Phantom Loads" that can increase energy bills by thousands of dollars each year. In most cases these additional loads go unnoticed, but real-time monitoring lets you identify and resolve issues before the costs add up.